Healthy people, such as athletes, rarely have severe health problems, right? Athletes are active and in shape; however, the notion that healthy people cannot suffer from dangerous health problems is wrong. Even some of today’s up and coming athletes are at risk of suffering from a variety of health problems. Take for instance JaMarcus Russell, the Oakland Raider’s ex-quarterback who came into the NFL with what seemed to be a promising future. 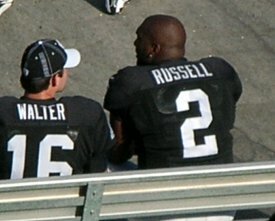 Russell was the Raiders’ first draft pick in 2007, thanks to a rocket arm and highly successful college career. Unfortunately, once the draft ended and the regular season began, Russell seemed to flounder on the field. His game was not up to par, and the skill and talent he showed just a season ago seemed to been missing. Coaches assumed that Russell was living a busy night life and was simply tired during games. But when questioned, Russell proved this to be false, which then prompted the team’s quarterback coach John DeFilippo to encourage Russell to undergo a sleep study. The results would ultimately prove why Russell was performing so poorly. After undergoing a sleep study, Russell was diagnosed with sleep apnea. He explained that practices were full of lethargy and a lack of energy, but no one seemed to know why; however, with this diagnosis, the puzzle pieces fell into place. Sleep apnea is known to cause sleepiness, fatigue, and impairs concentration and energy levels. Russell isn’t the first to suffer from symptoms of sleep apnea. In fact, legendary NFL lineman Reggie White died in 2004 due to complications of what many believe was undiagnosed sleep apnea. Whether you’re a world-renowned athlete or an ordinary person, you too could suffer from sleep apnea. If you experience unexplained fatigue, restlessness, daytime drowsiness and other symptoms, you may have sleep apnea. A physician-provided sleep study is the only way to diagnose sleep apnea; but with a diagnosis comes the need for treatment. For effective sleep apnea treatment options, come to Dr. Berry’s office today. Dr. Berry works on an individual basis to ensure that each patient gets the right treatment for his or her specific needs. Contact Dr. Berry online or call (303) 691-0267 today to get started.